Oh, boy. Here we go again. Another MadTree post? Yes. A thousand times yes. I heard about Rubus Cacao around this time last year and thought: "A chocolate raspberry beer? No thanks." What a difference a year makes! When I saw the brewery's release schedule for this year, and discovered that they were canning the stout for the first time ever, I became unreasonably excited and made plans to attend the beer's release. While they didn't have the stout on tap at the release, I did purchase a separate can (along with my to-go six-pack) to enjoy there. Apart from the rush of flavor, I didn't get much from it because of the sheer business of the taproom (so busy, in fact, that they sold out of Rubus cans). I'm looking forward to what I get from it from the quiet comfort of my beer-reviewing futon. I'm jumping right into the beer tonight. If you want to learn more about MadTree (a pillar in the community in which I live) be sure to check out their website and my two previous posts on the company. 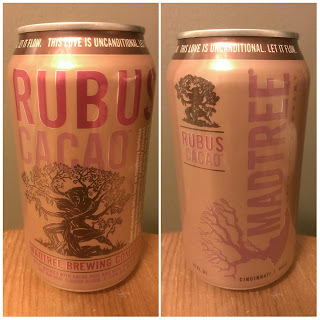 Although the description of Rubus Cacao on MadTree's website (scroll down to find it) differs slightly from the one on the can, the meat of it is the same. The 7.0% ABV brew has chocolate and raspberries in a bold mix of sweetness and bitterness. Other than that, there isn't much information to be had. The aroma of the stout lives up to the touted mixture of chocolate and raspberry, but I can't find any bitterness within it. It's all sweet. Which, is great for me but apparently very bad for Purrl. She refused to smell the beer at all. See that face? 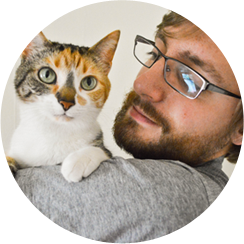 That's not the face of a cat who's invested in the scent of a beer. There is much more bitterness to be found in Rubus' taste. Yes, I can easily pick out notes of sweetness from both the chocolate and the raspberry, but these take second chair to the bitterness inherent to both individual flavors. Beyond that, there's a roastiness to it that I have come to expect from a stout. It's raspberry in the front, chocolate in the back, and delightfully, intriguingly, delicious. Much like its taste, Rubus has a mouthfeel that I'd describe as intriguing. It feels flat. And it should, given the style of the beer, be pretty flat. But I find tiny bits of carbonation lingering around the back of my jaw and filling my cheeks. There's also a slight amount of bubble burn on the tip of my tongue. Blame it on the sweetness of the beer, but I'm reminded of Valentine's Day. Not the Valentine's Day in second grade when I gave a girl the special valentine that came in the pack of Spider-Man valentines I picked out and the whole class laughed at me for it. No, I'm reminded of Valentine's Day my sophomore year in college. Instead of letting the residents to send love notes or candy to each other, my dorm's RAs decided to let us all send condoms to one another. I remember being at a video game party in the hall's lounge and grabbing a handful of condoms, scribbling humorous notes, and putting them in my friends' mailboxes. Did they ever use them? I don't know (nor do I really want to know). But it's the thought that counts, right? 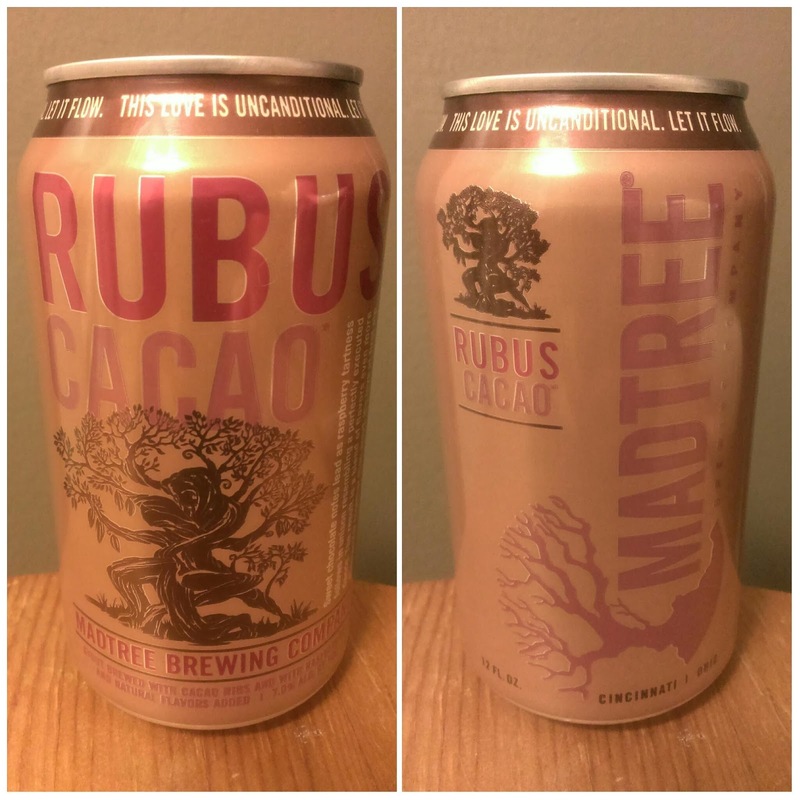 MadTree's Rubus Cacao is a damn good stout. The perfect blend of bitter and sweet. In the cold Cincinnati nights I've been facing lately, it is a can of decadent warmth. 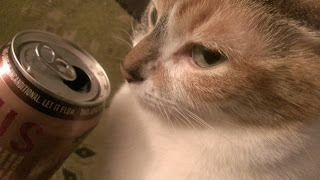 I'm giving it a 9.5/10 and I'm starting to think that Purrl may not have the best taste in beers.